The 2014/2015 Action Agenda is the result of over a year of work with state and federal agencies, tribal governments, local governments, representatives of the business and environmental caucuses, and other interested partners. 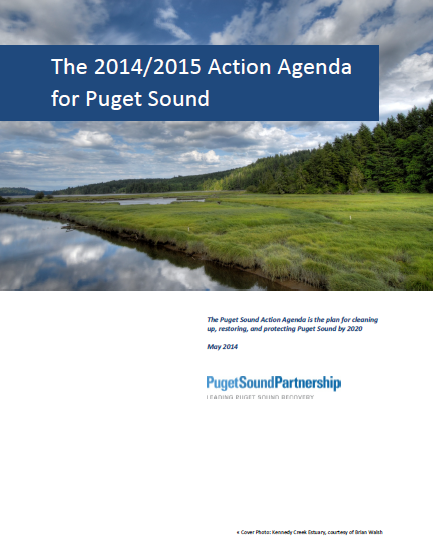 It builds on the 2012/2013 Action Agenda, and progress since then, to create a complete picture of the work needed to protect and recover Puget Sound. The Action Agenda is not a regulatory document; it does not establish regulatory requirements. It is a leadership and coordinating document, meant to focus the region around a shared agenda for Puget Sound recovery. The 2014/2015 Action Agenda is organized into five Sections. Section 1, Recovery Context, describes the recovery planning process for the Action Agenda. The section provides a broad overview of the legislative mandate, science in the Action Agenda, the relationship among the goals, indicators, pressures, and recovery targets. It summarizes the strategies, actions, and local planning efforts, introduces the strategic initiatives and cross-cutting issues, and, finally, directs the reader to performance management tools found on the Partnership’s website. Section 2, The Strategic Initiatives, describes the three Strategic Initiatives, adopted as part of the 2012/2013 Action Agenda, which are listed below. Prevention of pollution from urban stormwater runoff—we have many of the tools we need to do this but need the capacity to ramp up efforts; we must stop contaminating Puget Sound. Protection and restoration of habitat—we must save the best of the habitat that we have left. Recovery of shellfish beds—shellfish health begins on land through reduction of pollution from rural and agricultural lands and maintenance and repair of failing septic tanks. Section 3, Strategies and Actions, is the heart of the Action Agenda. It describes the strategies, substrategies, ongoing program activities, and near-term actions needed to protect and recover Puget Sound, as well as future opportunities. Strategies and Actions are divided into five categories. Freshwater and Terrestrial includes strategies and actions related to land development and restoration, stewardship of working forest and agriculture lands, floodplains, salmon recovery, and freshwater flows. Marine and Nearshore includes strategies and actions related to shoreline protection, alteration, and restoration; marine area protection and restoration; working waterfronts and public access; and biodiversity and invasive species. Pollution includes strategies and actions related to reducing toxic threats, polluted runoff from urban and rural lands, wastewater management, shellfish bed restoration, and oil spill preparedness and clean up. Strategic Leadership and Collaboration includes much of the core work of the Puget Sound Partnership, as well as some partners, including strategies and actions related to setting priorities, performance management, science and ecosystem monitoring, and promoting stewardship. Funding Strategy describes how increased financial capacity to implement priority ongoing and new actions in the Action Agenda can be achieved through identifying new sources of funding, using existing funding more strategically and efficiently, and developing innovative, market-based programs. Section 4, Local Recovery Actions, describes how local areas are working to protect and recovery Puget Sound. It contains profiles of each local area, which summarize local integrating organizations structure, planning process, locally significant pressures, and near-term actions. Section 5, References, contains the references for the 2014/2015 Action Agenda. The following appendices are included for additional information. Appendix A, Puget Sound National Estuary Program Management Conference Overview, provides an overview of the Puget Sound National Estuary Program Management Conference. Appendix B, Science Basis for the 2012/2013 Action Agenda, describes the scientific inputs to the 2012/2013 Action Agenda content and process. Appendix C, Results Chains, contains two sets of figures. The first set of figures presents graphical depictions of how the strategies (and related sub-strategies) contribute to reducing pressures related to a single recovery target. The second set of figures depict how each individual strategy in the Action Agenda (and its related sub-strategies) reduces pressures and contributes to achieving numerous recovery targets. Appendix D, Near-Term Actions, provides a consolidated table of all near-term actions (Soundwide and local) and their associated performance measures and owners. Appendix E, Action Agenda Sub-Strategy Rankings, presents ranked lists of sub-strategies by each of the Strategic Initiatives. Appendix F, Federal Response—Habitat Matrix, contains a matrix of actions that federal agencies are taking related to habitat.